Don’t forget to eat. That’s what my mother-in-law told my wife, then a teenager, just before she was left home alone overnight for the first time. Ha! the teen thought. As if anyone could forget to eat. But a mother knows how busy things can get. She knows we sometimes get distracted and forget to take care of ourselves. She knows that no matter where we’re from, where we are or where we’re going, we all need to eat, even though we forget to sometimes. Born in southern Minnesota, I came of age in Minneapolis, married in St. Paul, honeymooned in Europe and started a family in Duluth. Usually, I didn’t forget to eat. From a young age, I learned to garden and fish. I learned to raise livestock at the family farm in Morristown. In Waseca, I worked the corn pack at Birdseye and the dough machine at The Pizza Parlor. Some of it was fun, much of it was hard work, but it all sustained me and let me eat. Eat what? Similac formula, Gerber’s baby food, old school Velveeta mac and cheese, Cap’n Crunch, dirt-flecked garden carrots and rhubarb stalks from the back yard, Cannon River panfish, beef and pork from our family farm, gobs of blanched sweet corn, Bridgeman’s patty melts, Mama D’s spaghetti, tomatoes and cukes I grew behind my Phillips neighborhood duplex, paella in northern Spain, tapas in Madrid, tandoori in Paris, my own made-from-scratch tofu, crock pot wild game, Mississippi River walleye, Bluff Country brown trout, St. Louis County venison, the peanut butter and cheese sandwich I made last week and Grandma Marx’s filled coffee cake I made on Wednesday. That and more. From 1999 to 2001, I wrote stories for the Duluth News Tribune’s Taste and Home and Garden sections. Chefs and home cooks shared their creative passions with me. So did gardeners, who raved about their heirloom garlic, their berries and their hard-won northern tomatoes. And from 2004 to 2008, I wrote a weekly dining column, “A Table for Two.” N ot a review per se, it was a one-shot visit to a restaurant, with a guest who wrote to me and nominated a favorite menu item. I dined with close to 200 guests, whose ages ranged from 9 to 89. We feasted on bar burgers, 1-pound lobster tail, Thai tofu curry, burritos, onion rings, ribs, omelets, jerk chicken and gaucho steak, Lake Superior whitefish, old school Velveeta mac and cheese and one fabulous 79-cent raised glazed doughnut at the T. Patten Cafe in Orr. I interviewed my guests, got their reaction to the meal before us and reported their opinion under one heading. And under my heading, “Tom’s Take,” I wrote mine. I disagreed with my guests a few times over execution and matters of personal taste, but mostly I was an easy critic, unless the food was off, overhyped or both. Then on Dec. 4, I got some news. It was a family day, the seventh anniversary of our son Asher’s stillbirth. As we’d done each year since that date, we went to the Superior National Forest to cut our Chri stmas tree. We’d brought snacks and hot chocolate and cider. On the way home, we’d stopped for Lemon Angel Pie at the Rustic Inn, up on the North Shore near Two Harbors. There, we felt compelled to buy some candy we’d never heard of before: Asher’s Chocolates, made in Pennsylvania since 1892. I’m not so sure I did understand. I felt more like Greg Brown in his song “Canned Goods:” “With the snow and the economy and everything/I think I’ll just go down there and eat until spring.” As a freelance writer, I couldn’t hide in Grandma’s cellar and eat, even though at times I wanted to. Over the next few months I scrambled for new work, even as I lost another writing client, which represented nearly all of my income. I became depressed and found it difficult to work. Despite other serious symptoms, though, I was always able to remember to eat, helped no doubt by my naturally high metabolism. “It takes a lot to turn off my appetite,” I told my doctor. 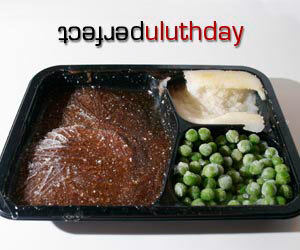 Then, this spring, doing online research for another food story, I found something new popping up in my search results: DuluthDish.com. Articles like “Minnesota Steak and Why You Should Eat Intentionally” caught my eye. So did the short stories and the listings, featuring some of my favorite restaurants and food purveyors. So I’m happy to be joining Duluth Dish, where I’ll write about restaurants, food and food people from our region and beyond. I’ll write about wild blueberries, wild rice and wild trout. I’ll tweet meals from restaurants and kitchen experiments from home. I’ll post odd quips, videos, photos and essays. I’ll draw on a background of nearly 200 “Table for Two” reviews, all the food I’ve ever eaten and most of all, my taste buds. But it’s not all about me. It’s about you, too. I’d love to see us build a community here and get some spirited discussions going up and down the food chain: from who has the best French fries to what Duluth needs next in its culinary evolution, from cheap eats to expensive treats — and why anyone would want to make their own tofu. I’ll do what I can to help things along. Sign up, post comments, email, tweet, and get your own blog going here. Use Duluth Dish to connect with people who share your passion for food. And please, no matter what else you do, don’t forget to eat. I’m so happy to see Tom writing again and writing about what he loves. I will look forward to the columns. Nice column, Tom! I think I could never do your job because the only place I ever want to eat is the Lake Avenue Cafe. Maybe you can help me branch out. So glad I found your new home. Glad you are writing columns again, I so missed Table for Two. Hi Tom, I wondered what happened to your column. Everyone I spoke to, and that was about a dozen at least, since the time we went to The Bangkok (Thai) Restaurant said they all read your article and usually went to the restaurant in question. I’ve always looked for your article and will be looking for your new one now that I know it is going to be published. Anything I can do to help, just ask and you shall receive. Thanks again for the nice dinner. Sweet! I’m looking forward to this.